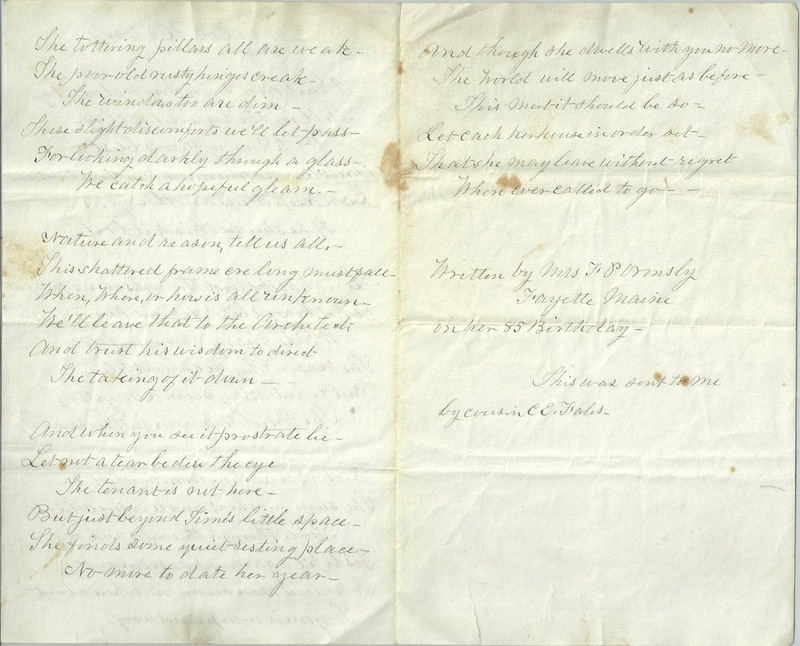 Sheet containing a handwritten poem by Mrs. Z. P. Ormsby or Mrs. F. P. Ormsby of Fayette, Maine, on her 85th birthday. 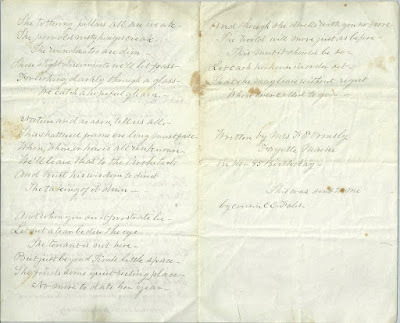 The person who received this poem indicated it had been sent by cousin C. E. Fales. There was a Zeriah Powers who married Daniel Ormsby on 18 May 1815 at Wilton, Maine; they settled at Fayette. From what I could find online, she lived to be at least 85. Perhaps she went by F. P. rather than Z. P.? I found a reference of the marriage of Lemira C. Ormsby and Francis Pennell on 10 December 1843 in Kennebec County, Maine. Makes one wonder if Francis Pennell's last name was perhaps also Ormsby, or if one of Lemira's male relatives had a child named after Francis. 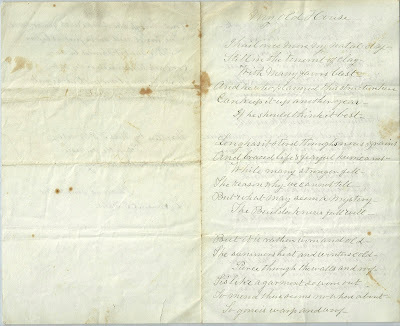 At first I had thought this poem might have been written by Fidelia Phelps, who married James Ormsby or Ormsbee, but I found a date of death for her that indicated she lived only into her 40s, if that reference is correct. 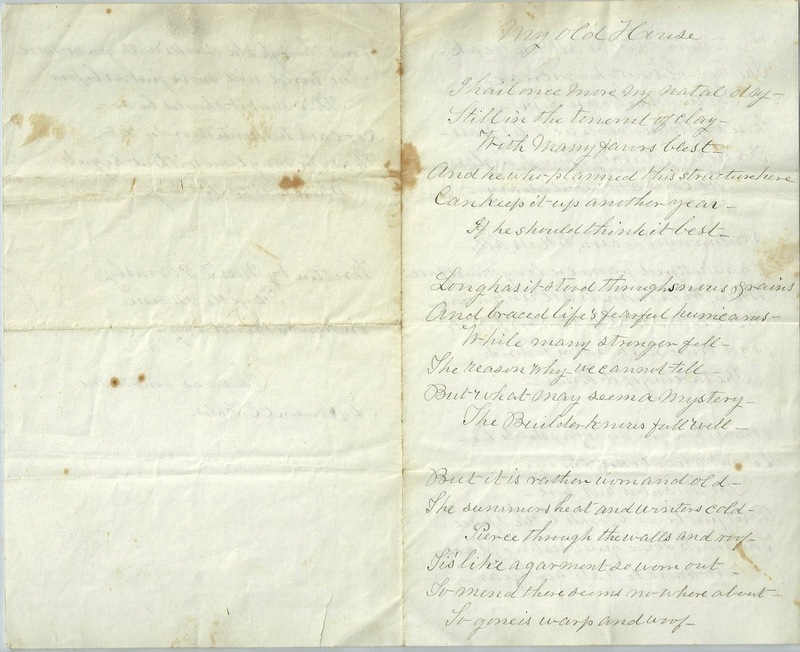 I'm hoping that a member of the Ormsby family or Fayette, Maine, historian will solve the mystery of the poem's author by leaving a comment in the comments box or contacting me directly. If he should think it best. We catch a hopeful gleam. The taking of it down. No more to date her year. Written by Mrs. F. P. Ormsby, Fayette, Maine, on her 85th Birthday. This was sent to me by cousin C. E. Fales. What a very interesting poem, Pam. Makes one stop and take assessment of oneself, doesn't it? I enjoyed it. Thanks for sharing the poem, Pam! I hope you someday solve the mystery of who wrote it! Thanks for your comments, Judith and Bill. I'm on the lookout for next year's entry into your contest, Bill.